Our client, Boise Paper, partners with many organizations to make a positive impact on the community. The company works with the General Mills Box Tops for Education™ program to help students and parents across the country earn money for their schools to purchase essential items, such as books, art supplies, sports equipment, instruments and more. 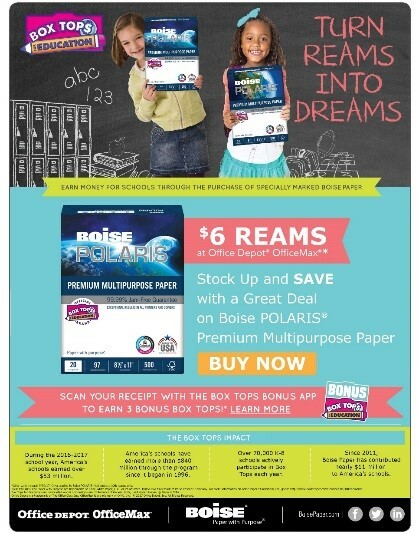 As the exclusive office paper brand of the Box Tops for Education program, Boise Paper is proud to support local schools and children in the communities its customers call home, and help schools get the essential supplies they need by offering Box Tops clips on select reams of paper. In 2017, LCWA helped promote two major campaigns to support the Box Tops for Education partnership during key seasonal timeframes – back-to-school and the holiday season. Our fall influencer program featured blogger partners sharing why they purchase products with Box Tops clips. Several influencers had a personal tie to Box Tops, and their passion for the program was evident in the great content they created. Check out great posts from Classy Mommy, The Simple Parent and A Parenting Production. 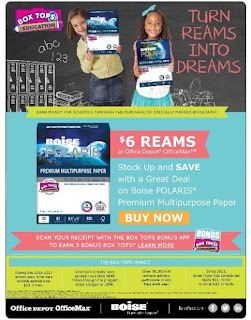 We also created Facebook ads and distributed an eblast to consumers to make sure all were aware of the Box Tops for Education clips available on Boise Paper products during the vital back-to-school shopping season. A few months later, we helped to promote the annual Give the Gift of Box Tops Sweepstakes where entrants had the chance to win one of three prizes of 10,000 Box Tops clips and 400 reams of Boise Paper products for their favorite school. With a press release to announce the launch of the sweepstakes, a Facebook ad to target parents of school-aged children and ongoing social content to maintain interest, we were able to help increase the number of entrants by more than 20 percent over the previous year. 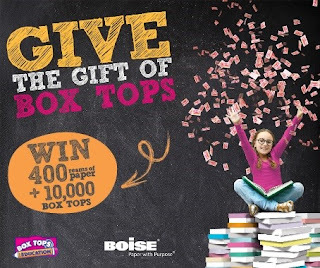 Most importantly, three schools in Waterford, Mich., Ashland, Mont., and Bentonville, Ark., are able to buy needed supplies thanks to Boise Paper and Box Tops for Education! We’re always excited to help our clients celebrate their valuable community contributions, and look forward to continuing our efforts for Boise Paper in 2018.